Made of some soft, buttery yellow linen (the fabric is a gift from a friend) and is reversible with some vintage reproduction fabric. 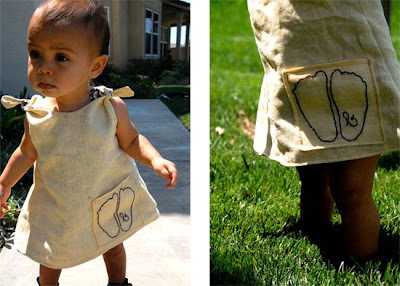 Come on, every new walker needs to be able to have free little legs in linen! Of course, a trace of her teeny footprints embroidered, along with a tiny “b”, onto a sweet pocket is a perfect way to remember this important milestone in my Brave’s life. Well, it seems she did some tumbling too!!! These dresses were quite fun to make. I have really been challenged and inspired by many talented women to make more natural, creative, and heirloom-ish dresses for my girls. 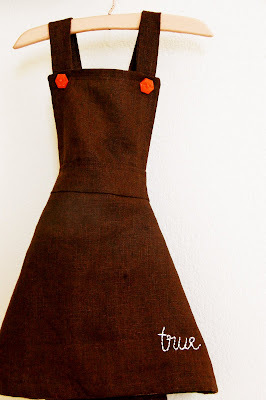 I think it is so much more special to have a mama-made dress… maybe they will pass this on to their girls one day! ***Thanks Helen for teaching me new tricks!!! Wow- I love your dresses! Too cute. WOWWWW…i love love it so much. great job! Oh, brilliant creations! I LOVE both of them! Wow!! This baby have so beautiful dress!! Nice pictures!! Both of those dresses are ADORABLE. Brave and True are so blessed to have such a creative Mama making them special things so often! I think what you’re doing is great. Love the footprint detail! Great way to keep track of those walking feet brfoe they grow too big. Oh my gosh!! I just love the little walking dress. What a great idea. I was just thinking that the brilliance of Melissa and Lynne has rubbed off on you too!!! These dresses are too cute! I love the the little feet tracings!!! I wish I had done more of that when my two were little… you only get one chance and then they grow. Nathalie is a great friend to send that cute fabric! 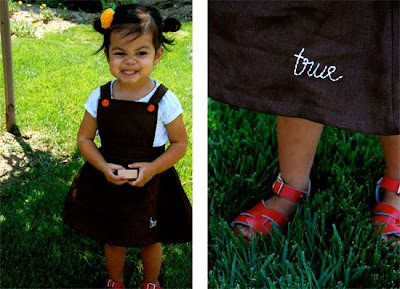 And I can’t believe that Brave is walking around now and True is just a doll in her jumper! They will definitely think this is cool when they grow up! how wonderful the gifts were used for such special little dresses!!!! ohhh ruby you just made my day!!!!!!!!!! i love both of them…and love even more the photos of the girls wearing these special creations!!!! you rock! Oh your embroidery is just divine! It really makes the dress. Adorable! I especially love the personal touches, like Brave’s initial and footprints and True’s name…So sweet and things they will treasure forever! 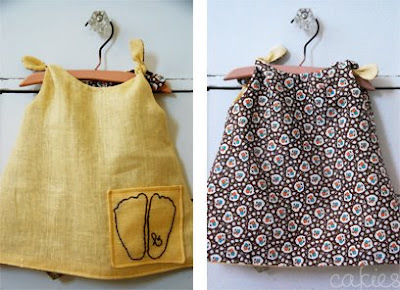 You are inspiring me to want to sew! Oh thank you so much everyone! it really meant so much to make these dresses and i am still learning the ins and outs of dressmaking. i wish i was pro like the girls over at Sugar City! Melissa- You and lynne are just so amazing! I wish one day i could be half as fantastic as you!!! nathalie- I love the fabric!!! thank you so much!!! i was so glad to make something so special from this … thanks times a million! Sam- have a girl! they are loads of fun… but i am sure boys are too! Iris- I agree… forget about old navy! go mama-made!!! but i do still love old navy, but our budget has no room for that store, so i just make everything! Thank you again everyone… i am so encouraged by you and i am so excited that my hands are getting fuller with Brave’s new talent! These are darling! The footprints on the dress are so great. Lucky little girls! Just for a moment, and only a moment, it would be fun to be sewing for really little people again. I’ll just have to make for others when that mood hits. ‘Cuz I’m done with babies at my house.